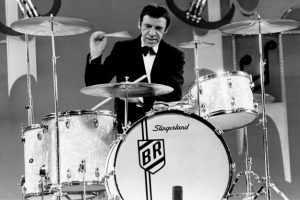 Happy 100th Birthday Buddy Rich! Buddy Rich: Born on this day 100 years ago, September 30th 1917, in Brooklyn New York. Buddy Rich: One of the greatest drummers of all time, would have celebrated his 100th birthday today. To commemorate the great man, we’ve put together a little overview of his life, including some interesting lesser-known facts. A drummer with breathtaking skill, timing, and dynamic range, Rich knew how to play with immense intensity but also the lightest touch. His drum solos are world-renowned, and he was a first-class all-round performer (also having a short career in singing and acting). Rich’s legacy lives on, having directly inspired countless other drumming greats including Dennis Chambers, John Bonham, Ian Paice, Steve Gadd, Simon Phillips, Bill Ward, and Cal Palmer, to name just a few. Dave Weckl says he used to slow Buddy Rich’s records down to half-speed to learn the patterns. Jim Chapin considered Rich to have had the most accurate timing of any drummer he’d ever heard. Gene Krupa famously said that Buddy Rich is “the greatest drummer ever to have drawn breath”. Buddy Rich first stepped into the spotlight as a vaudeville child star, starting at just 18 months old. His parents were both performing musicians. 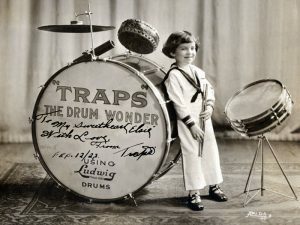 Rich became known as “Traps, The Drum Wonder” at a very young age, and at his peak as a child star, he was the second highest paid child entertainer in the world. Rich was performing as band leader by the age of 12. Interestingly, he claims that he never had any formal drum training, and that he could not read music. Buddy Rich’s jazz carrer started in 1937 in New York. 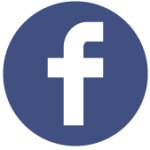 Not long after, at the age of 21, he got into a fist fight with Frank Sinatra – Rich says he was standing up for a saxophone player, with things getting physical after Sinatra threw a large glass pitcher across the room at Buddy. Over the years Rich played with legends including Louis Armstrong, Dizzy Gillespie, Gene Krupa, Charlie Ventura, and many more. Rich was famous for his volatile outbursts, and his extremely high standards for both himself and his fellow musicians. He expected his musicians to perform no matter how sick they were, telling them that if they can stand, they can play. One story has Rich breaking an arm after tripping while playing handball, and continuing to play shows with one arm for the next three months. Across his career, Buddy Rich drew huge crowds. He performed jazz, swing, big band, and over the years was featured on numerous television shows. Even today, 30 years after his passing, he is arguably still the greatest drummer of all time. Rich suffered heart attacks in 1959 and 1983, with his doctor telling him to stop drumming or risk having another. 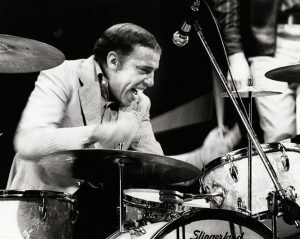 In typical Buddy Rich style, he continued playing up until his death in 1987, dying of heart failure while having treatment for a brain tumor. 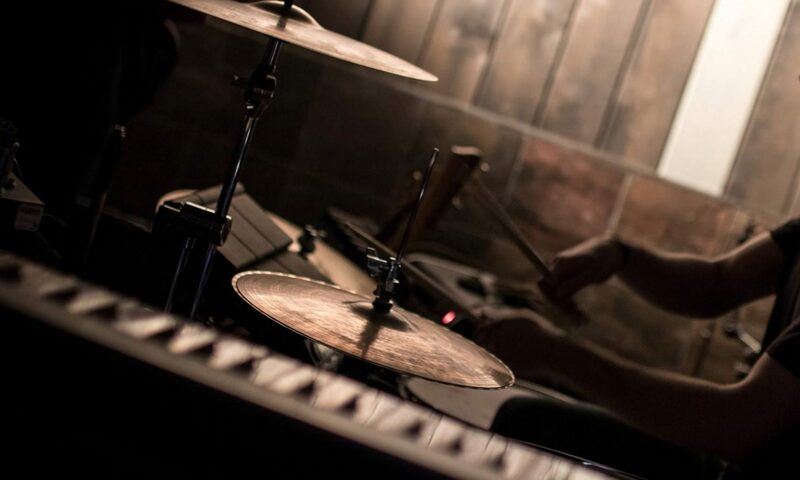 Rich used Ludwig, Slingerland, and Rogers drums, Zildjian cymbals, and Remo drumheads across his drumming career. His drumhead of choice was the Remo Coated Diplomat. While Buddy exclusively played Remo drumheads, Aquarian (!) have recently released a limited edition Buddy Rich snare drum head to commemorate his 100th birthday. This head is released in partnership with Cathy Rich (Buddy’s daughter), and is made with a single 10mil ply and special warm “white vintage” coating. This is a little thicker than the 7.5mil Coated Diplomat, which Buddy preferred. There are rumors that Buddy Rich was actually born on June 30, 1917. This is unconfirmed though, so we’ll stick with September 30th. Previous PostPrevious Yamaha’s 50th Anniversary Celebrations: September 30th in L.A.